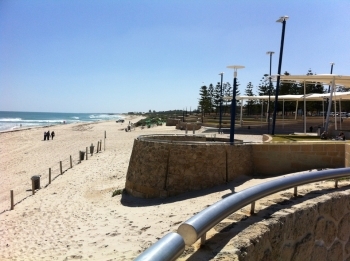 Just 25 – 30 minutes or approximately 14km northwest of the capital city, Perth, lies beautiful Scarborough beach. Perfect for a peaceful holiday by the ocean to relax, get away from the hustle and bustle of the CBD and enjoy the white sandy beach and crashing ocean waves. Scarborough is really just a small township with local shops, a hotel and a few cafes. There are several holiday resorts close by but they don’t impact on the quaint seaside village atmosphere. 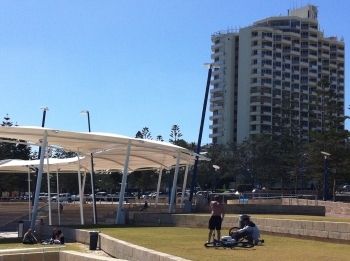 Most days you will see surfers catching a wave at Scarborough beach and windsurfing, kitesurfing and sailing are also very popular. For those of you that are not so energetic you can’t beat sunbathing or walking along the long stretch of beautiful coastline. If you are a keen photographer you will find Scarborough beach to be picture perfect with an amazing shot from every angle. The hotel dominates the skyline in Scarborough as being the highest of the resorts. The hotel was built in 1986 and is in the process of a major refurbishment. This should be complete by the beginning of 2013 however until then it is not a very pleasant place to stay. The older rooms seem to have major problems with their air conditioning. The very old air conditioning system struggles to keep room temperature constant and as a result it is too cold one minute and too hot the next with no individual controls to correct it. I couldn’t believe the old style TV’s that were in the rooms. These I thought were obsolete years ago. The Rendezvous hotel is an icon in Scarborough and I am sure once these renovations are complete it will be restored to its former glory. 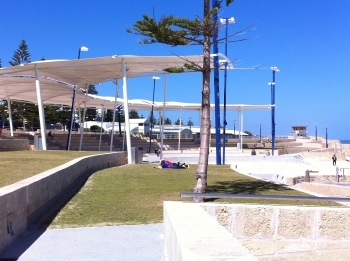 Just outside the Rendezvous hotel you can get the bus to the city and also to Westfield Shopping Centre at Innaloo. It’s not a huge shopping centre but you will be able to find a good selection of shops and most things that you would want to buy. The bus to catch is number 400 and it will cost you $1.90 each way and runs every 15minutes. Buses also run regularly to other shopping centres and into Perth CBD. There are several restaurants overlooking the beach as well as a hotel that sells meals and coffee. I chose to have lunch at the Dome restaurant that is directly behind the Rendezvous hotel. The best part about this is that is sits high above the street and has amazing views to the ocean. There is a bridge over the road that leads to the beach which is also very convenient. 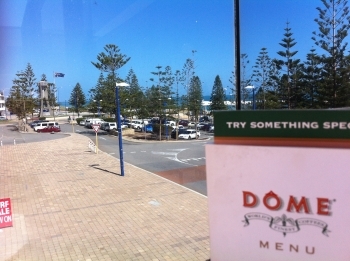 The Dome restaurants are scattered all over Western Australia. They are usually quite large, have good service and serve good food.